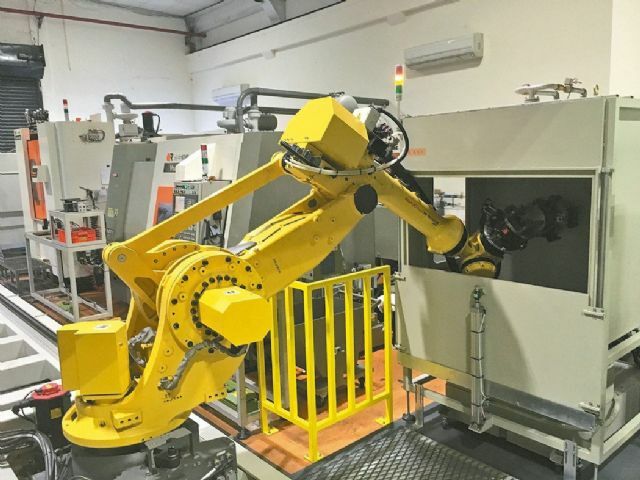 Automating production with robots is regarded by Taiwan’s major manufacturing companies as a savvy strategy against rising local labor cost (photo courtesy of UDN.com). With robotic technologies continuously advancing, Taiwan's major companies in local manufacturing industries have actively moved to introduce robots to production lines as a means to cope with chronic manpower shortages and continuously rising labor costs. Among these companies, Hota Industrial Mfg. Co., Ltd., one of the largest precision auto transmission component makers by size, confirmed in late 2016 that it will bring in over 1,000 units of various robots to fill job vacancies in production lines, including transportation and packaging tasks, in its factories within four years, so as to minimize the impact of the enforcement of the so-called “one fixed day off and one flexible rest day” policy by the Taiwanese government since December 23, 2016, an amendment to the Taiwan Labor Standards Act, which is widely believed to result in wage hikes. David Shen, chairman and CEO of Hota, stated that to conform to the new labor policy, his company will likely see an estimated increase of 9.4 percent in annual labor cost, or an equivalent of some NT$43 million (approximately US$1.38 million), based on its overall monthly payroll for the moment, hence being forced to resort to robots and automation. The four-year investment, which involves the procurement and installation of robots and necessary software, is estimated to cost Hota roughly NT$1 billion (US$32.175 million). Based on Hota's current manpower resources of some 900 employees, Shen stressed that the company will hopefully attain its annual turnover goal of over NT$10 billion (US$321.75 million) in 2019 after all the robots to be procured become online. In fact, Hota has for some time worked on production automation through constant investments, including a brand new factory located in the Dapumei Intelligent Industrial Park in Chiayi County, southern Taiwan, which is scheduled to start up this March and will employ a full line of intelligent manufacturing equipment to not just boost the company's overall output by 30 percent, but ensure a nearly 100-percent yield rate. Coincidentally, Taiwan Hon Chuan Group, the biggest maker of bottle caps, PET bottles and preforms on the island, has also planned to increase the use of robots in production in the coming years, to respond to the implementation of the “one fixed day off and one flexible rest day” policy. Presently, the company employs about 1,500 workers in Taiwan, with around 60 percent of its manufacturing tasks being fulfilled with automation technologies, including robotic arms. Meanwhile, Hiwin Technologies Corp., a globally known supplier of precision linear motion components and robotic arms, has claimed to step up automating its production and provide more extensive training programs to employees, in an effort to buffer the impact of worker wage hikes in the wake of the enforcement of the said new policy, and enhance overall production efficiency.